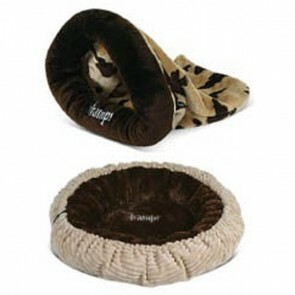 We stock a wide range of Cat Beds including: Hooded Cat Beds, Duvets, Bean Bags & Donuts suitable for small and large cats, including plastic cat beds which range in size from 15 to 21 inches available in 3 different colours, just look at the other pages on this website Plastic Cat Beds. We also stock Cat Radiator Beds that allow a cat to sleep on the side of the radiator for wrap around warmth and comfort. Cradling the cat in a safe warm hammock which moulds instantly to the shape of your cat for maximum comfort. Cats sleep about 16 Hours a day, but like to feel Secure and Warm, when sleeping the hours away! The premium range of cat beds, hooded sleepers, donuts, duvets and bean bags shown below are all machine washable. A Premium range of Luxury Cat Beds in 3 Comfy Designs; Cafe Latte, Autumn Stripe and Blue Skies, that have been designed to Complement the Modern and Natural Styles around the home! Soft Cat Beds: 5 stars out of 5 based on 4 user reviews. Hi, I ordered a Moscow Rosewood luxury cat cushion from you just before xmas for my cat as a xmas present. It came on Christmas eve and I was impressed how good it looked and she loves it! Can't get her to move off it for long, best thing I've ever bought her she says! Thanks. Was pleased to find on your website cat and dog that match. 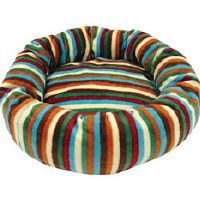 So I purchased one autumn stripe dog bed and one autumn stripe cat bed. Even thought I mixed the beds by having cat and dog I still got the special offer of free delivery. I have 2 Bengal cats who absolutely love these beds. They are great for playing hide and seek games. Also they love to snuggle inside if cold or sit on top if warm. Highly reccomended!!! My kitten loves it. Hours of play.